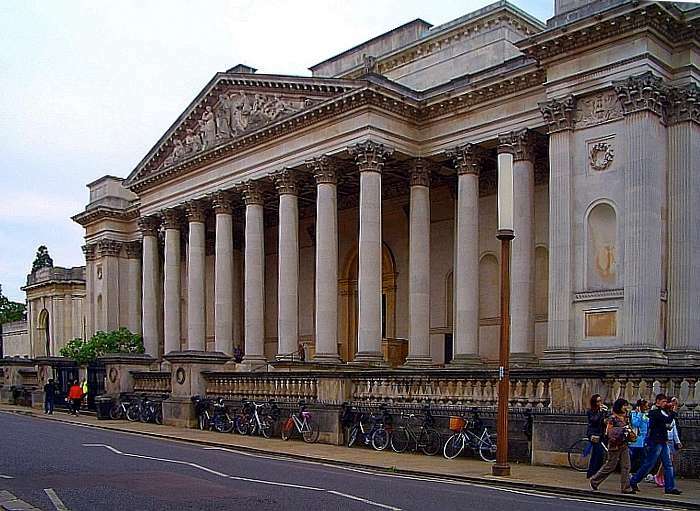 Fitzwilliam Museum, Cambridge by George Basevi, 1837-45; C. R. Cockerell, 1845-63; and E. M. Barry, 1870-75. Portland Stone. 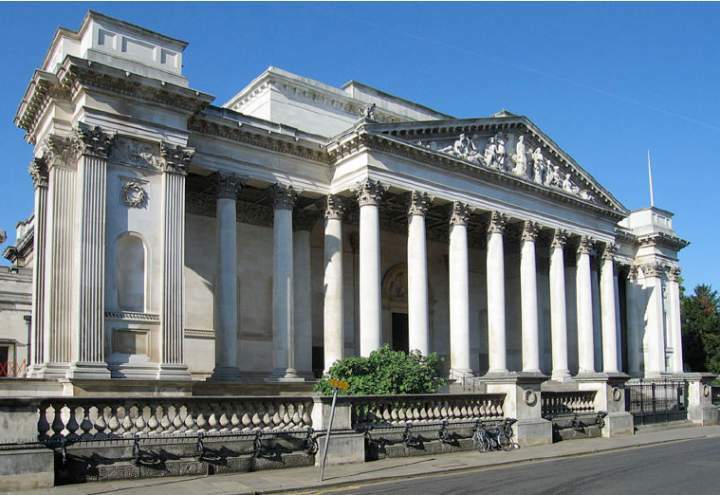 Visitors to Cambridge naturally focus on the colleges, and also enjoy the collections of the Fitzwilliam Museum — but may not look closely at the museum building itself. Yet it is an important piece of architecture. Captions in Tim Rawle's book, Cambridge Architecture, label it variously "neo-classical" (58) and "Victorian Baroque" (34); in fact, as Nikolaus Pevsner explains, it is "one of the most telling examples in the country of the turn away from the purity of neo-Greek towards a Victorian Baroque which took place in the thirties and forties." 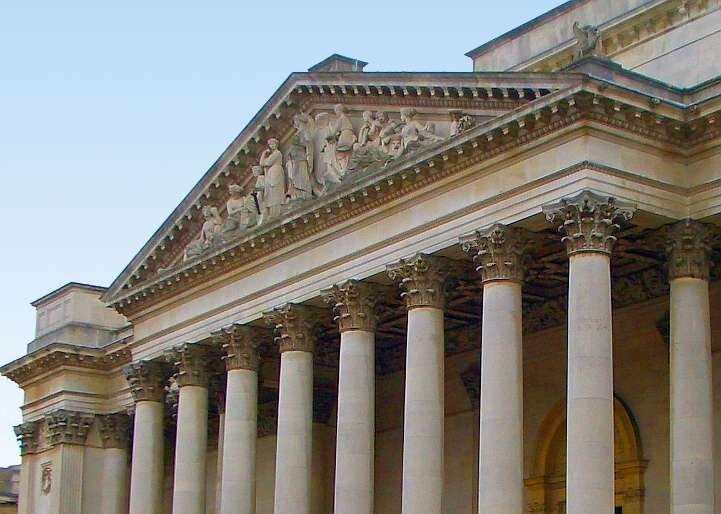 Pevsner feels that the bold projection of the portico produces "an element of restlessness," and that the "coffering inside the portico" is "even richer and further removed from classical sobriety" (210-11). 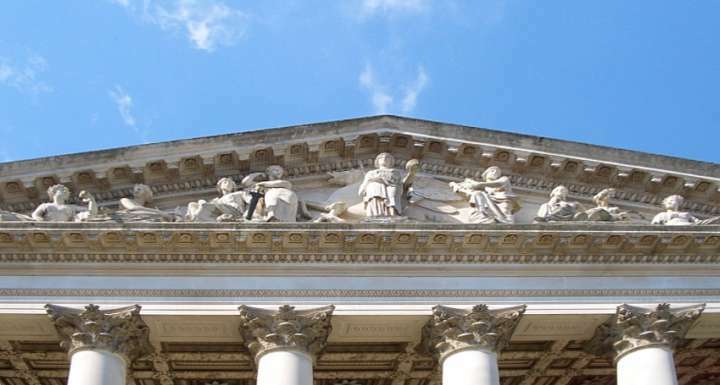 Pevsner's judgment is echoed by that of Richard John, who describes the "whole composition" as being "decked out in a fully elaborated Corinthian order of unparalleled richness." John substitutes for the idea of "restlessness" his own expression "sculptural dynamism." As John suggests, the architect George Basevi's great achievement here was to make a building which can only be seen at an angle (because of the narrowness of the street) so monumentally impressive. The Museum seen from the other side. After Basevi's tragic death while inspecting the tall west tower of Ely Cathedral, the construction was supervised by C. R. Cockerell, and then by E. M. Barry. 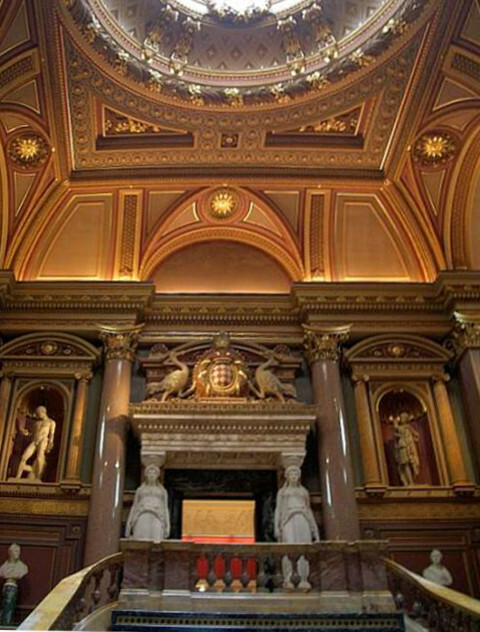 But even the staircase hall, not completed until 1875, was basically Basevi's design (see Pevsner 211n.). "The New Fitzwilliam Museum," contemporary engraving. Photographs and text by Jacqueline Banerjee. [You may use these images without prior permission for any scholarly or educational purpose as long as you (1) credit the photographer and (2) link your document to this URL in a web document or cite the Victorian Web in a print one. John, Richard. "Basevi, George, 1794-1845." The Oxford Dictionary of National Biography. Online ed. Viewed 13 July 2008. Rawle, Tim. Cambridge Architecture. London: Andre Deutsch, 1985.